The free Tree of Life diagnostic and goal setting activity from Positive Acorn was developed under the guidance of Dr Robert Biswas-Diener, the Indiana Jones of Applied Positive Pscychology . Happiness not only feels good, but is beneficial to relationships, work and health. It is helpful to set realistic expectations about happiness. No one is intensely happy al of the time. Robert Biswas-Diener is proud to contribute refreshing new research and is known for challenging the psychology and positive psychology status quo. He also joined forces with his father and mother to create the Noba Project. Believing that knowledge should be made available to all, regardless of cultural, geographic, or economic background, they created Noba to give students and instructors free and open access to world-class psychology resources. I have personally trained and certified with Robert, and continue to apply his experiential learning style in all my leadership development programs. In addition, he continues to provide a treasure trove of simple and creative leadership and coaching tools and programs. Aside from his many books, he also co-authored an important and much needed book on the Upside of negative emotions. The Tree of Life Activity from Positive Acorn is a popular way to do goal setting, as it is fun to do. Unlike the Wheel of LIfe used by mainstream leadership development experts and life coaches, it is based on the belief that it’s important to consider our lives holistically. What I love most about it is that you can scale this activity rapidly across thousands of people without requiring expert coaches or psychologists to facilitate it. The visual thinking helps clarify thinking and stimulates somatic ingraining to help support the achievement of goals. 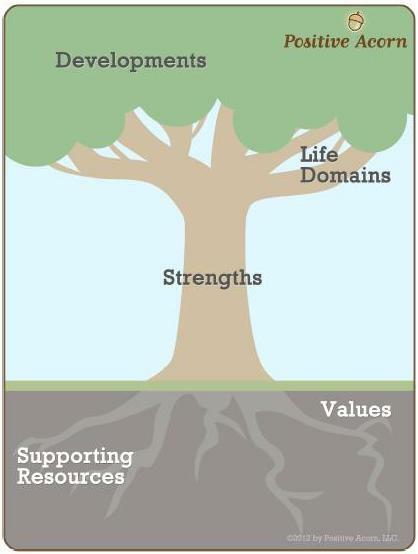 Just like trees grow within an eco-system, we are supported by a strong sense of relationships that rely on an interconnection of components to function effectively. Download the free activity guide and explanations from the Positive Acorn website. Get a clean sheet of paper, as well as some coloring pencils or pens or do the activity using your digital art toolbox. Complete the activity, sign it and write the date. I also enhanced the activity, by inviting people to draw a sun with their Tree of Life. The sun represents that which gives you energy, motivates and inspires you, in particular more difficult times in your life. Put your Tree of Life in a place where you can look at it each day. Tip: Redo the activity in six months to see what changed. Tip: Each One Teach One. Share the knowledge forward by facilitating a conversation with others and helping them draw their own Tree of LIfe. Tip: It is a great Team Goal Setting activity.